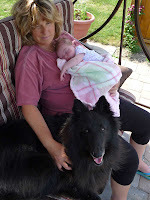 Family Dogs and growing babies....life, lessons and love! 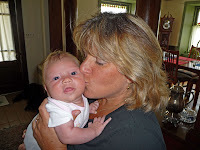 : Feedback from a Mom and dog professional! Thank you Ali for sharing! Having been a professional dog trainer for ten years as well as being 8 months pregnant, I was very excited to host a Dogs & Storks seminar at my training school. The presenter, Leigh Siegfried, did a tremendous job with her explanations and discussio ns. The powerpoint was well laid out and covered not just points I expected but also quite a few thought provoking ideas for me. By the end of the 2-hour presentation, I had found two things that I have to work on with my dogs! I'd strongly recommend that all parents-to-be with dogs attend one of these seminars. I'd also encourage trainers to host these seminars on a regular basis. This is where we can really start to educate adults and children with respect to our canine family members! Author of "Scaredy Dog! ", "Scaredy Dog!" DVD, and "Focus, Not Fear"